Once upon a time, Juiced.GS was complemented by an exhaustive library of 3.5" floppy disks. With software releases and updates then a regular component of the Apple II scene, we offered subscribers a way to get these programs as a physical product. For readers whose Apple II computers weren't connected to the nascent Internet, it was an excellent way to get their hands on the latest Apple II wares. These disks, which were eventually collected into the Friends For Life CD, were always sold separately — with one exception. When readers received Volume 3, Issue 4 (December 1998), they found it came with a bonus: a free, limited version of GSoft BASIC, the new programming language from The Byte Works. This 3.5" floppy was at the time an exclusive bonus to Juiced.GS subscribers and was an example of the collaborative opportunities available between our print publication and the Apple II community's vendors and members. In June 2012, Juiced.GS went way retro and did the unprecedented. 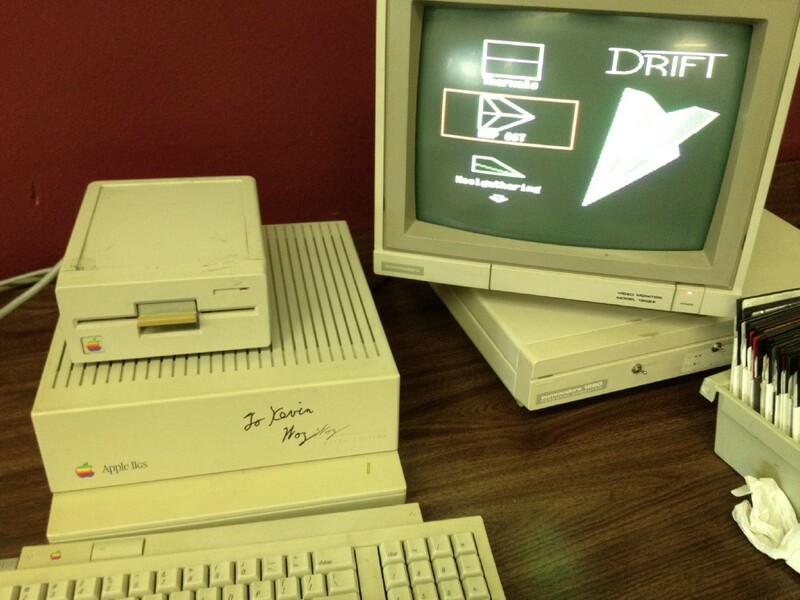 Along with the magazine, subscribers to Volume 17, Issue 2 received a 5.25" floppy disk with a copy of Drift, a demodisk originally released at the PixelJam demoparty in early 2012. A collaboration across three continents, Drift contains the music of Daniel Kruszyna and Wade Clarke, the code of Antoine Vignau, and the ASCII art of Melissa Barron. With the exception of Daniel, all have contributed articles to Juiced.GS — but Daniel made up for that oversight by sponsoring and coordinating this bonus, which Melissa Barron made even more invaluable with a limited-edition, hand-crafted, numbered floppy disk sleeve. Real software calls for real hardware! Photo by Kevin Savetz; used with permission. This disk was distributed exclusively to subscribers of the first run of Juiced.GS's June issue; those who subscribe late or buy the issue as part of a back volume can instead find the disk image available online as a free download. For those who received the floppy: may it inspire you to explore your classic Apple II hardware with the latest, greatest software!